I really enjoyed the book and found much meaning in it relative to my life. Thank you for the book and for writing it. I just finished the audiobook and was so excited to learn about how to think and operate a business in the context of great storytelling. This is one of the best books I have ever read. Period. There are millions of people who own small businesses; and millions struggle. The Highest Calling is the inspirational story of one of them – Troy Becker. Troy has struggled for 12 years with his remodeling business. Not making much money, working 70 hours a week, his family life suffering – Troy is frustrated and confused. One day, an old man named Cy, mysteriously appears in Troy's life – and keeps appearing. Cy, who is on a desperate journey of his own, comes to understand he has been put there to help Troy – but why? And how will he convince Troy to listen? The Highest Calling is the story of helping others and of learning how to do the right things to succeed. Cy weaves the most important and powerful business principles of all time into the lessons he delivers to his student; for Troy's sake – and his own. His teachings are beneficial to businesspeople and managers alike. You will laugh, you will cry, and you will learn. 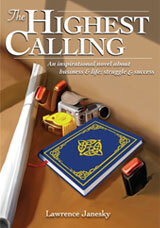 The Highest Calling is more than an inspirational book. For those that seek, it is a powerful entrepreneurial education; one that will improve the lives of millions for a lifetime. 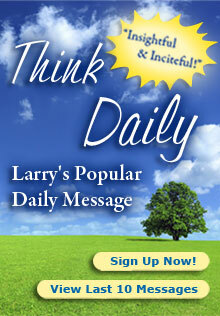 Sign up for updates on future work by Larry!